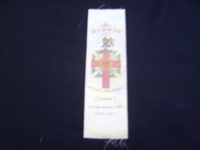 CLEVELAND, AUGUST 1877, BATTALION ST. LOUIS KNIGHTS TEMPLAR, ST.LOUIS NO.1, IVANHOE NO. 8, ASCALON NO. 16, ST. ALDEMAR NO. 18. SPECIFY A OR B. 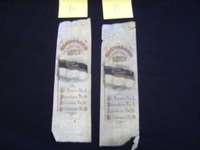 A IS IN BETTER CONDITION THAN B. 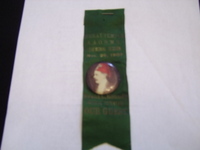 RIBBONS 8" X 2 1/4"
EVERTS NO 18, ROCK ISLAND, ILLINOIS, CHICAGO, AUGUST, 18880 CLEVELAND, AUGUST 1877. 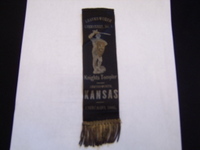 RIBBON 7 3/4" X 2 1/4"
LEAVENWORTH COMMANDERY NO.1 KNIGHTS TEMPLAR, LEAVENWORTH, KANSAS, CHICAGO 1880. 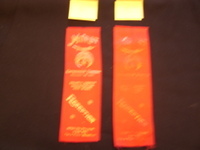 RIBBON WITH BULLION FRINGE SIZE 7 3/4" X 2"
RIBBON WITH ATTACHED PIN. 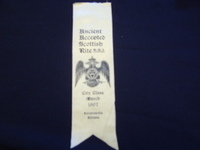 MURAT TEMPLE A.A.O.N.M.S., CEREMONIAL SESSION, NOV. 29, 1907. FRANK C. ROUNDY, IMPERIAL POTENTATE. OUR GUEST. 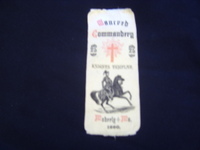 RIBBON 6 1/2" X 2"
GODFROY DE BOUILLON COMMANDERY NO 44 K.T., STATIONED AT MATTOON, ILLINOIS, CLEVELAND, OHIO. AUG.28, 1877. SPECIFY A OR B. 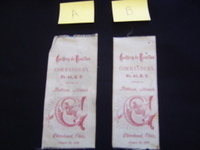 A IS IN BETTER CONDITION THAN B.